MFA 1982, Visual Studies Workshop, Rochester, New York. BFA 1979, Cornell University, Ithaca, New York. 1991 Recipient of New York State Foundation for the Arts Fellowship. 1987 Recipient of New York State Foundation for the Arts Fellowship. 1983 Selected for the 1983-1984 New York State Artists-in-Residence Program. 1977 New York State Council of the Creative and Performing Arts Photography Grant. 2014 Susan Eley Gallery, New York, NY. The Tall Tale: Folk, Fantasy & Fear in the Art of the Fairy Tale. 2013 Soho Photo, Alternative Process Competition, New York, New York. 2013 One Woman Show, Donald Gallery, Dobbs Ferry, NY. 2013 Silvia White Gallery, Summer Juried Show, Ventura, California. 2013 Lazarus Gallery, “Art of Play Exhibition”, New Rochelle, NY. 2012 One Woman show at Atelier, New York, NY. 2010 Group exhibition at Target Gallery, in Alexandria, VA.
2009 Group exhibition at Tilt Gallery, Tempe, Arizona. 2006 The Fifth Westchester Biennial, Castle Gallery, New Rochelle, NY. 2005 Group exhibition titled, “Paper Cuts”, Tabla Rasa Gallery, Brooklyn, NY. 2005 First Prize and honorarium in show titled, “Rembrance and Renewal” Lankenau Hospital Gallery, Philadelphia, PA.
2005 Group exhibition, “Wish You Were Here IV”, A.I.R. Gallery, NY, NY. 2005 Lancaster Museum of Art, Photo National exhibition, Lancaster PA.
2005 Honorable Mention for the 2005 Juried photography exhibition at the Smithtown Township Arts Council, St. James, NY. 2001 One woman show at Saint Peter’s Church, New York, NY. 2001 Photography exhibition at 92nd Street Y, New York, NY. 2000 Three person exhibition, “Surrealistic Images” at The Hopper House Art Center, Nyack, NY. 2000 Photography exhibition at the Visual Studies Workshop, Rochester, NY. 1999 “8th Annual Showcase Exhibition” at The Alternative Museum, New York, NY. 1998 Group exhibition, ”Art as Spectacle” at Katonah Art Museum, Katonah, NY. 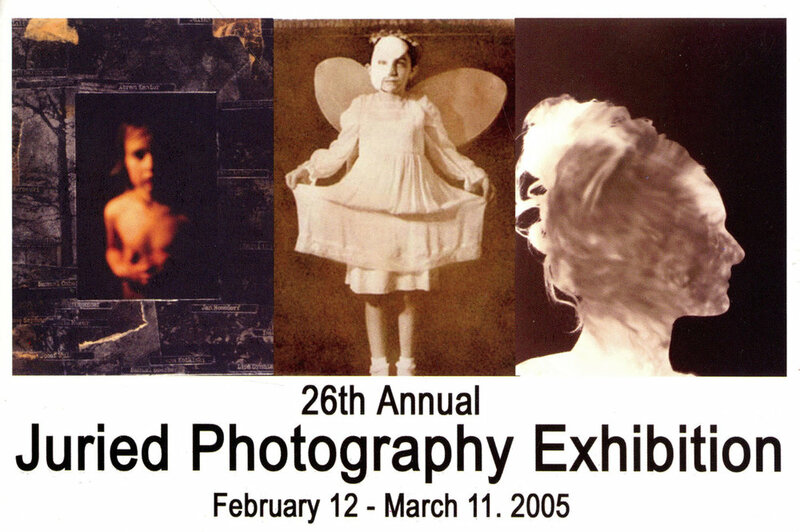 1998 Photography exhibition at The Dobbs Ferry Art Workshop, Dobbs Ferry, NY. 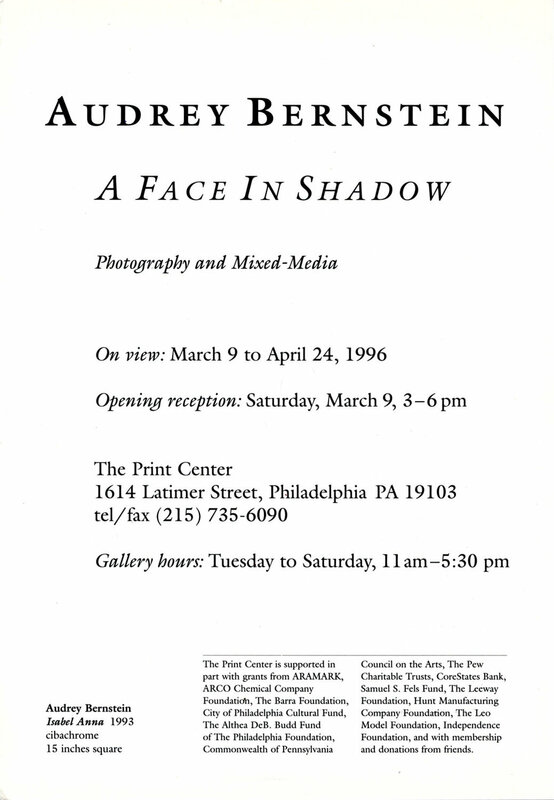 1996 One woman exhibition, “A Face In Shadow” at The Print Center, Phil., PA.
1995 Photography exhibition, “Color Fall - 4 Photographers” at Candace Perich Gallery, Ridgefield, Connecticut. 1995 Group exhibition, “Show and Tell” at 450 Broadway Gallery, New York, NY. 1994 The Print Club Selection Awards (solo exhibition at The Print Club) selected by selected by Charles Hagen. 1994 Group exhibition, “Familiar Strangers" at The Print Club, Philadelphia, PA.
1992 Group exhibition "Daring and Uncommon," at Marymount Manhattan College, New York, N.Y.
1991 One woman exhibition, "New Works" at Selena Gallery, Long Island University, Brooklyn, New York. 1989 One woman exhibition, "Fragments & Voices" of cibachrome photo-collages, Ledel Gallery, New York, N.Y.
1988 Exhibition of color photographs in a group show, "Billboards," Littlejohn-Smith Gallery, New York, N.Y.
1988 One woman show of color photographs at D’Arcy, Masius, Benton & Bowles, Inc., New York, N.Y.
1988 Exhibition of color photographs in one person show at Hyperspace Gallery, Miami Beach, Florida. 1986 Two person exhibition of color photographs at Fervor Gallery, New York, N Y. 1986 Exhibition of color photographs at SSC&B Advertising Agency, New York, N.Y.
1985 One woman show of black & white and color work at Il Fotogramma, Rome, Italy. 1985 One woman show of black & white photographs at Ken Damy Photography, Brescia, Italy. 1985 Selected for "Contemporary Photoworks III," a photography exhibition presented by Albuquerque United Artists, Albuquerque, New Mexico. 1984 Exhibition of color photographs in a group show at Chung Cheng Gallery, St. John’s University, Jamaica, New York. 1983 One woman exhibition of black & white photographs at Pentaprisma Gallery, Barcelona, Spain. 1983 One woman show of color photographs in Spectrum Gallery, Barcelona, Spain. 1983 One woman show of color photographs in Gaus Fotografiskt Galleri, Stockholm, Sweden. 1983 One woman show of B&W photographs in Pentax Galleri, Stockholm, Sweden. 1983 Exhibition of color photographs in group exhibition at Atrium Gallery, University of Connecticut, Storrs, Connecticut. 1982 Exhibition of black & white photographs in group exhibition at Chautauqua Art Gallery, Chautauqua, New York. 1982 Exhibitions of black & white and color photographs in two group shows, "Spiritual Art" and "Made with a Camera," George Frederick Gallery, Rochester, New York. 1981 Exhibition of color photographs in "Mystic Photo II," juried by Harry Callahan and Lee Witkin, Mystic Art Association, Mystic, Connecticut. 1981 Exhibition of color photographs in a national photography competition: “The Landscape,” Winter Park, Florida. 1980 Exhibition of color photographs in “Exposure Time IV”, James Madison University, Curator: Bart Parker. 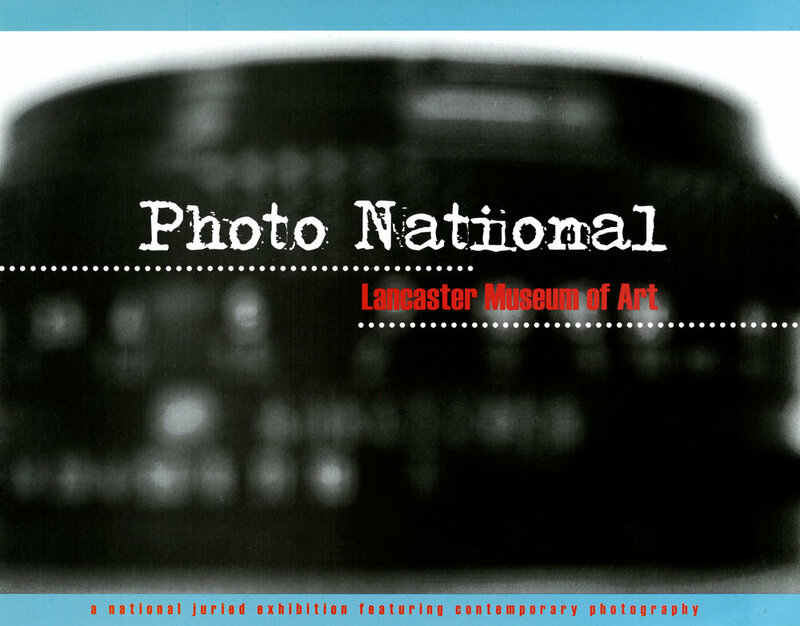 1980 Color photographs selected for “Photo-National” exhibition, juried by Duane Michaels and Bea Nettles. Erie, Pennsylvania. 1978 Publication of a eight part series of black & white photographs in Praxis:Journal of the Arts, Vol.4, No.1. 1977 Exhibition of a black & white ten part series in "New Muses, 1978," Johnson Art Museum, Ithaca, New York. Associate Professor of Photography: Long Island University, Brooklyn, New YorkResponsible for a range of photography and computer graphics classes in a media arts department. 1997-Present. Faculty Position: International Center of Photography, New York, New York. Development of courses designed to cover a thorough overview of color theory and range of processes for color photography. 1986-1997. Commercial Photography: Specialize in record covers and editorial work. Clients include: Arista Records, RCA Records, Polygram Records, CBS Records, Time Magazine, The Village Voice and others. 1989-1997. Adjunct Assistant Professor: St. John's University, Jamaica, New York. Responsible for photography classes within a fine arts department. Design and execution of new course curriculum for history of photography program. 1984-85. Adjunct Associate Professor: Long Island University, Brooklyn, New York. Responsible for a range of beginning to advanced classes in black and white and color photography in a media arts department. 1983-85. Teaching Position: Hofstra University, Hempstead, New York. Continuing Education classes in black and white and color photography. 1983. Adjunct Professor: Jersey City State College, Jersey City, New Jersey. Color class for fine arts majors. 1983. Color Technician: Ultimate Image, New York, New York. Responsible for printing artist’s portfolios such as: Cindy Sherman, and Laurie Simmons and others. Adjunct Teaching Position: National Technical Institute for the Deaf, Rochester Institute of Technology, Rochester, New York. Program developed to prepare deaf students for placement in a commercial custom color lab. 1982. Photography Teacher: Sabbatical replacement at the University of Rochester. Responsible for the design and execution of curriculum for beginning black & white course. Fall 1981. Head Teacher of Photography Program: Mount Herman Preparatory School, Northfield, Mass. Development and coordination of photography curriculum for 40 students. 100 New York Photographers. Schiffer Publishing, October 2009. By Cynthia Dantzic. Visions of Angels. 35 Photographers Share Their Images. By Nelson Bloncourt and Karen Engelmann, 1998. Photomontage, A Step-by-Step Guide to Building Pictures. By Stephen Goldring, 1997. Exploring Color Photography. Third Edition. By Robert Hirsch, 1997.